How to Milk a Unicorn… No Really, How? Victoria Silchenko recently posted an article on LinkedIn, Confession of Venture Capitalists: How to milk a Unicorn where she interviewed some high profile VCs and Private Capital experts on the recent “private IPO” trend. Great topic, catchy title and excited that BootstrapLabs will be joining the discussion live at her upcoming Global Alternative Funding Forum on November 6th in Los Angeles. Don’t miss it! Having lived in Silicon-Valley for over 16 years as an entrepreneur, investment banker and tech investor, I have had the privilege to work with David Weild, count Will Bunker among my friends and co-investors, and have met with both Tim Draper and Andrew Romans. And I cannot help but wonder what the impact of these billion dollar companies going for Private IPOs will be on the liquidity cycle of Venture Capitalists. 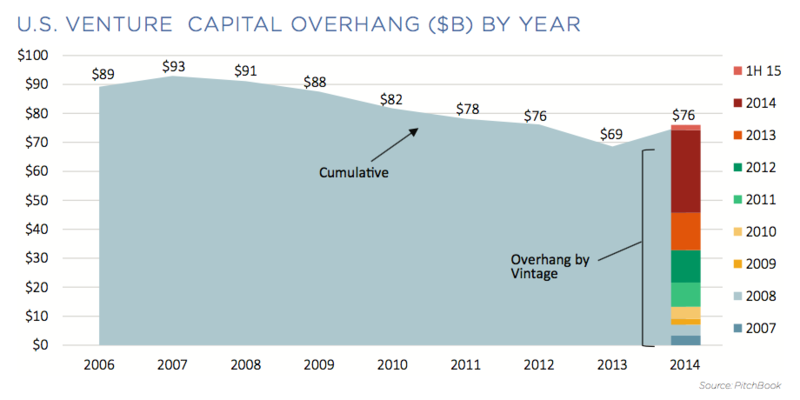 Ability to offer liquidity to existing investors that had supported the company until then (average startup age at IPO is 7+ yrs lately, and trending up) as well as employees. These liquidity events do not happen at the IPO stage but usually during a Follow-On (FO) offering, as main investors and management teams are considered insiders and are under lock-up agreements for 180 days post IPO (and subject to trading limitations thereafter). This one gets interesting. 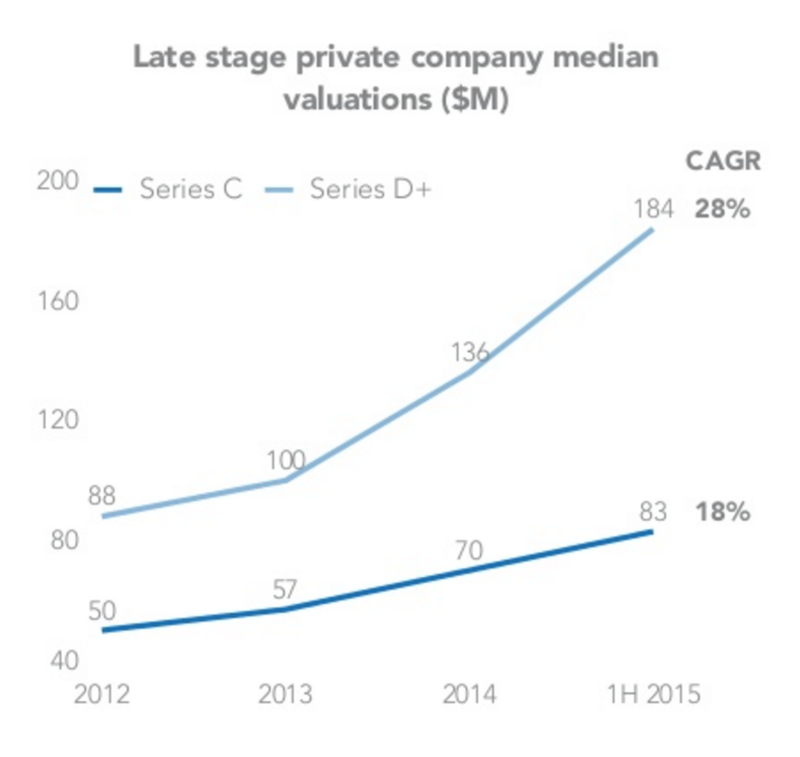 There is little information out there but these large “Private” IPO rounds often include some – at least partial – liquidity for the founders, early investors and sometimes employees. 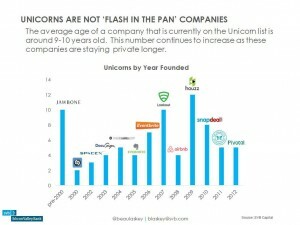 The average Unicorns’ age is about 9+ years according to Beau Laskey at SVB , which is longer than the life of most VC funds. 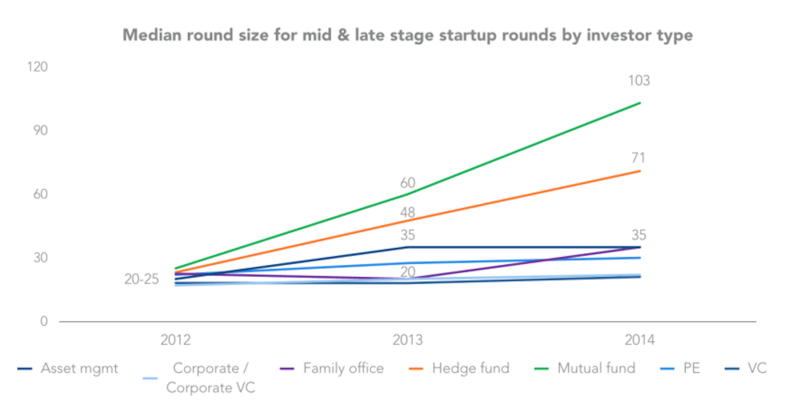 As such, it should come as no surprise that VCs, especially the ones that came in early, would seek liquidity in those later stage mega rounds. 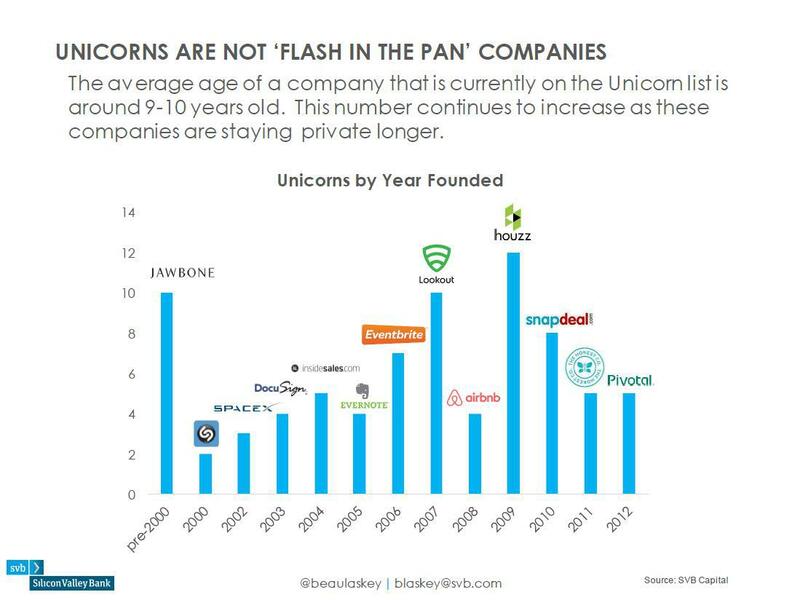 Unicorn are not overnight successes. 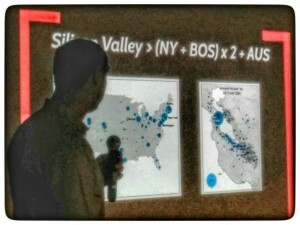 As the saying goes in Silicon Valley, Overnight Success takes 10 years! 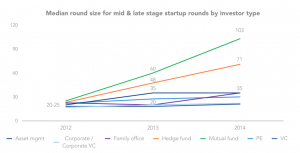 Valuations are sky-rocketing in the private market once a company reaches Unicorn status…and one has to wonder if it is due to sheer speed of execution and the breath-taking growth rate experienced by these startups, or a demand driven phenomenon where every deep pocket investor wants to ride this rising giant sooner rather than later, and deploy a large chunk of capital into it for a 1.5-3x return. These returns sound really good, especially when you are able to deploy over $100M at a time after some of the major risks appear to have been removed. In comparison, public market returns have eroded and it is getting harder and harder to find alpha at scale. 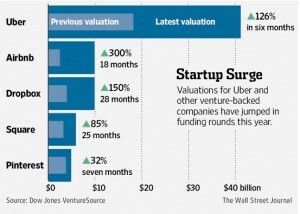 This is a one year old chart: Uber is now worth $10Bn more! 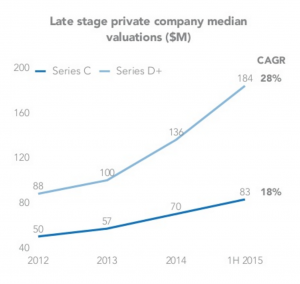 Are Later Stage Investors Valuation Insensitive Due to their Preference? Andrew Romans had an interesting point in Victoria’s article in that the last money in gets liquidation preference (and sometimes anti-dilution protection in the event of a down round). That would basically make those investors valuation/price insensitive as they would get their money out first in case of trouble and that the valuation of these companies would likely not fall below their investment amounts to begin with. But in case of Qualified IPOs, these liquidation preference would go away and even if the opening price is higher than the last round of funding valuation, nothing would prevent the stock from tumbling down. See this good post on IPO down rounds. Are Insiders Allowed to Lock-in Profits Quietly? Another risky dynamic at play here is the liquidity provided to insiders as part of these later rounds. In a public setting, if an insider sells his shares he would need to disclose it to the public; but in those mega rounds of financing, only major investors are posted on the transaction structure, leaving out of the loop a lot of people inside and obviously outside of the company. Wouldn’t you think that knowing that the founder(s) of your company have locked in some of their gains would be important news? 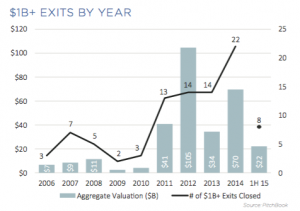 While M&A still represents between 90 and 95% of the return on capital for VCs, the list of potential acquirers for Unicorns is shrinking by the minute as their valuations are significantly higher then those of the very incumbents they seek to disrupt. As an example, Group Accor ($9Bn market cap.) can no longer buy AirBnB ($25Bn). 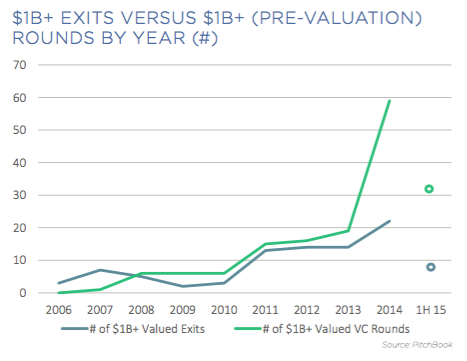 Maybe a good way to look at what is happening is by drawing a chart with valuation against time, with a typical Unicorn curve, pre- and post- IPO. 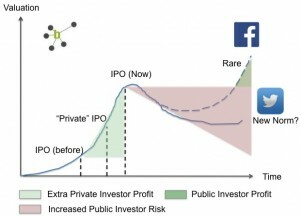 In that context, it is pretty clear that a lot of the growth and value that was once captured by public investors (including you and I as retail investors), is now being captured by the late stage growth and cross-over investors, while increasing the risk/return profile of Unicorns in the public market once their valuation has been “maxed out” in the private market. so you can bet they will want to party on! 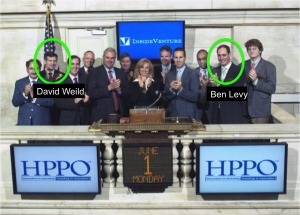 I remember ringing the bell at the NYSE in 2009 with my startup InsideVenture, for the launch of our new product, dubbed “HPPO” for Hybrid Public Private Offering. 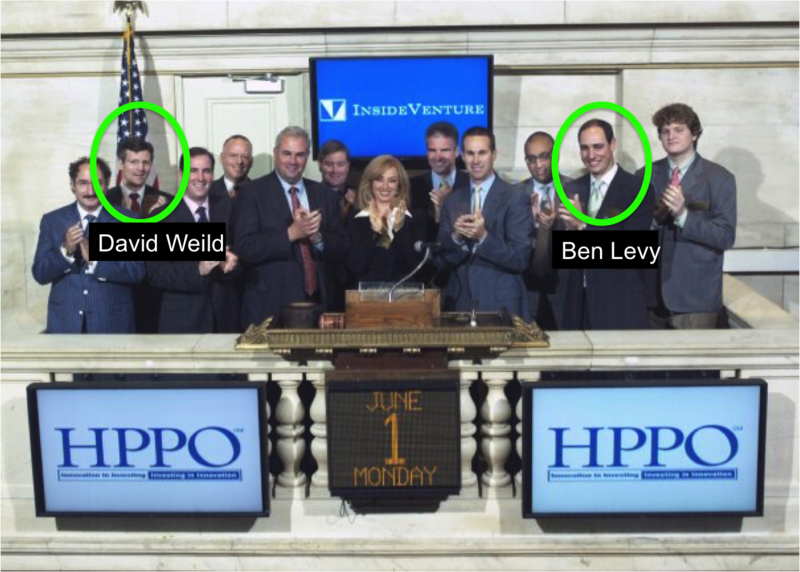 At the time, VC-backed IPOs and Wall Street in general had ground to a halt after Bear Stearns and Lehman went down. 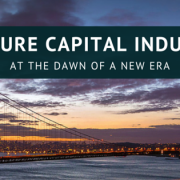 We talked about ways to fix the IPO market and “orderly transition” of the cap table with top VCs such as Ray Rothrock from Venrock and Scott Sandell from NEA. 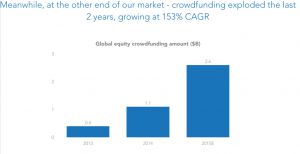 With new regulations such as Reg A+, allowing private companies to crowdfund up to $50M and trade their shares on secondary markets, it looks like the future might be just that, a world where public investors are finding their way back into ventures, earlier in the growth curve! As Bill Gross told us last Thursday, “Timing is everything”…we were just 7 years too early! https://bootstraplabs.com/wp-content/uploads/sites/4/2015/09/How-to-Milk-a-Unicorn...-No-Really-How.jpg 824 1099 Benjamin Levy http://bootstraplabs.com/wp-content/uploads/sites/4/2018/08/Bootstrap-website_white_logo.png Benjamin Levy2015-09-28 17:48:242017-01-19 11:28:48How to Milk a Unicorn... No Really, How? 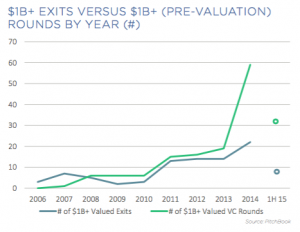 The venture world is changing profoundly and over the next few months we will see a huge increase in “big” seed stage (Pre Series A) deals. 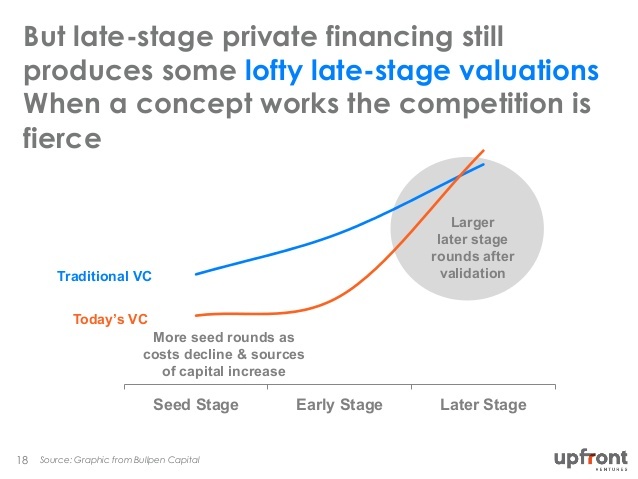 As Ben Levy, co-founder of BootstrapLabs, mentioned in his recent blog post “Seed is the New Series A”, we will over time see more and more seed stage investors creating syndicates and inviting fellow angels to co-invest in their deals. 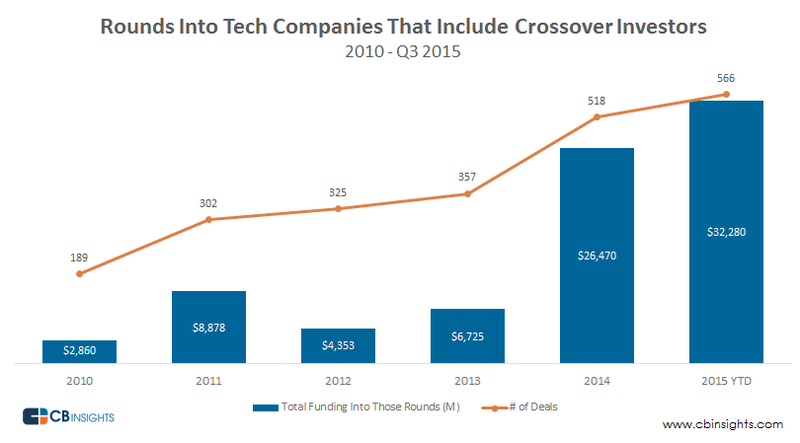 The number of angel deals, crowdfunding platforms and micro VCs is growing dramatically. *the majority of these funds of this size are closed without any traditional institutional LP backing. Source: CBInsights; graphic BootstrapLabs. 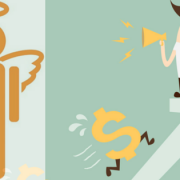 Learning the ins and outs, strategies, and best practices needed to be a successful angel investor is not easy, but here are a few steps you can follow in order to get started in this exciting new world of “private is the new public”. 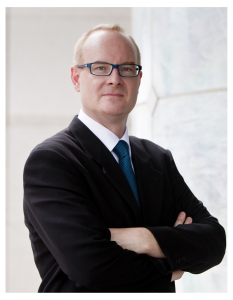 Angel investing is often considered by many people to be like a poker game, but with the new market structure and the emerging models of crowdfunding, I believe that Angel investing is becoming more of a team game than a solo gambling endeavor. One of the most important steps for an Angel Investor is gaining access to quality investment opportunities and spreading their risk by diversifying investments (into a minimum of 10/15 deals if you are active and closer to 30 if you are passive). To invest in 10 good deals you should meet and evaluate at least 100 startups, and this is not easy thing if you are doing angel investments on the side! You should probably not make 10 investments at once or in a short time span by the way…each deal you invest in will teach you something, and you definitely want your later deals to benefit from your early ones. This is also why joining a syndicate on a crowdfunding platform or investing alongside or in a Venture Capital fund is recommended. Participating in deals with experienced and expert investors will reduce your risk and save you the time of doing due diligence. In any case, if you have not already done so, the first thing you need to do to become an angel investor is to verify your Accredited Investor status for a variety of reasons, not the least of which is to make sure the startups do not get into hot water with the SEC for selling private securities to “naive” investors. For more information read the SEC documentation. 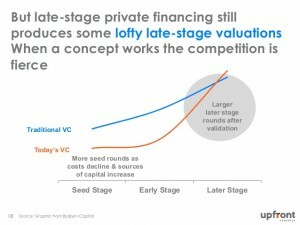 Angel investing is buying equity (or convertible securities that can be converted into equity) in a startup company at the earliest stage of a company’s lifecycle. These investments are high risk but also potentially the most profitable since investors benefit from lower valuation and their relatively small check still buys a decent amount of ownership. On that note, angel investors should not aim to “own” or “control” a business if they want to ensure the long term success of their investment. If you should feel you have to do this for the company to succeed, you might be better off investing in another company altogether. Why is access to good deals limited today? 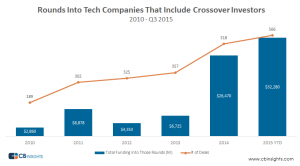 Because good deals are mostly funded by people who do angel investing as a full time job, and includes a few friends in their trusted network, the financing round will be filled very quickly and will be closed before anyone else even knows about it. Today, competition is very high in this space and the majority of good startups are participating in accelerator programs and/or having their deals syndicated on platforms like AngelList by expert seed stage angel investors and even Micro-VCs. 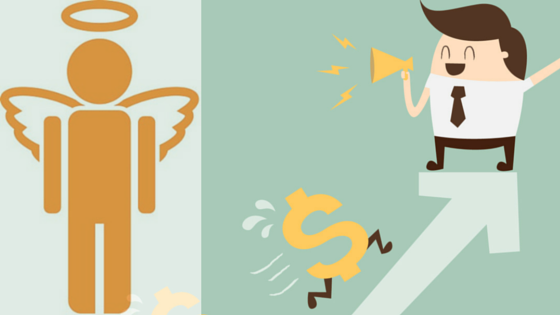 Why do startups need Angel Investors? To pay for their initial expenses and to provide capital to build the first version of their product. 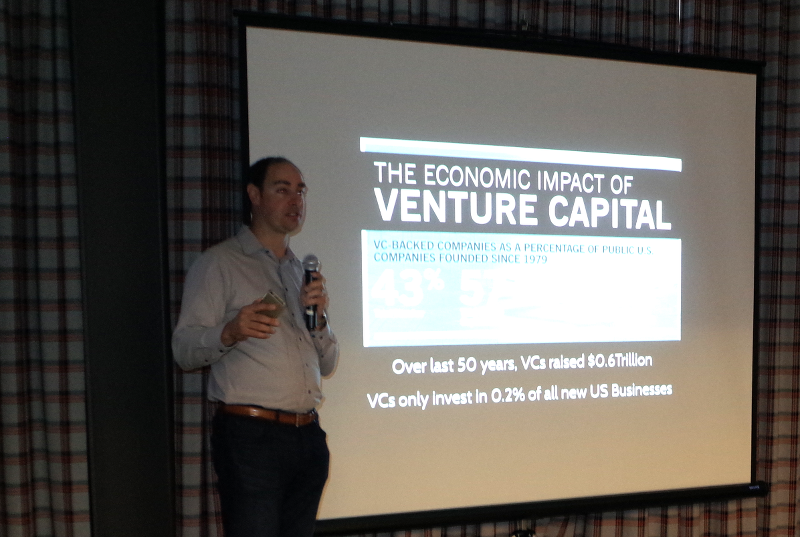 Also for many startups, finding an Angel Investor is a good way to prove that their endeavor is or will be valuable. 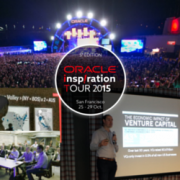 Validation by expert and successful Angel Investors is considered by other angels or seed stage VCs as almost a requirement these days to rise above the noise level. From a startup’s perspective, it is very important to have respected and value-add Angel Investors on their cap table at the beginning of their journey, especially when the time to raise another round arises, and it will always be sooner than a founder would like to admit. 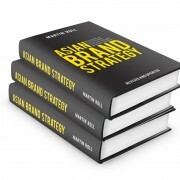 What does the typical Angel Investment Strategy look like? As described above, one of the most important steps to becoming a successful Angel Investor is having access to good deal flow. Angel Investing is a high risk investment and you have to invest in at least 10 deals (would recommend even more with small checks) over time in order to diversify your risk. While the typical Angel Investment is between $5K to $25K; the return of a successful Angel investment can be up to 500x but you will also face the very real fact that 50% of the investments you make will have a low or even zero return, as many startups fail. 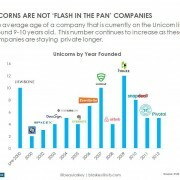 To reduce your risk and increase your chance of investing in the next unicorn at an early stage (500x return) as a new Angel Investor, the best thing to do is to participate in deals with other trusted investors or invest a bigger check into a VC to start building your network and knowledge in this space! I will publish more articles regarding this topic soon, so if there is anything you would like to add or ask, please contact me @luigicongedo ! Also I would like to recommend this NY Times article to learn how the world of angel investing has changed in Silicon Valley in the last decade. https://bootstraplabs.com/wp-content/uploads/sites/4/2015/09/PRODUCTIVITY-AND-FOCUS.png 315 560 luigicongedo http://bootstraplabs.com/wp-content/uploads/sites/4/2018/08/Bootstrap-website_white_logo.png luigicongedo2015-09-04 16:51:472017-01-19 11:29:14Learn how to be a successful Angel Investor!